If you’ve ever had a dog bolt out the front door and down the street, back out of a collar in fear and run, or wondered what you would do if you lost your dog, this is the podcast for you. Finding lost dogs takes a small army of community members who know many of the finer points of what works and what doesn’t in catching a dog that has reverted to her primal mind — a dog that does not recognize her own family when they call out for her. It’s a harsh lesson so many learn the hard way, even as their dog left the house moments ago, calling her name and chasing her does nothing but drive her further away. If calling and running after your dog is not going to work, what does? How many different places do you need to notify of your lost dog to cover all bases? What organizations specialize in this work and are they in your area? What tools can be used to lure your dog back home or into a confined area? How can you organize reported sightings to set traps in areas likely to bring success? What else do you need to know to be better prepared should this happen to you and your dog? Finding lost dogs involves using the right tools, getting help from skilled people, and luck. Being prepared in advance should this happen to you or someone you know can raise your chances of a successful capture and might even speed up the process of bringing your dog back home. 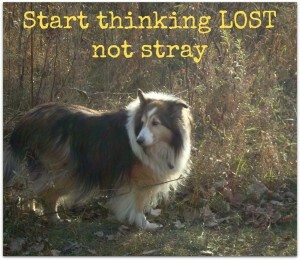 Mel Freer was helped in her search by Minnesota Sheltie Rescue and Lost Dogs of Minnesota. Who’s working in your area? Enjoy the podcast! 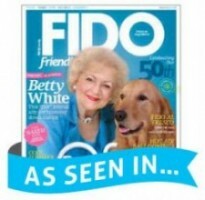 Thankfully, Mr. N doesn't go far away from me but I've rounded up my fair share of lost dogs! Mary, thank you for writing about this super important topic. 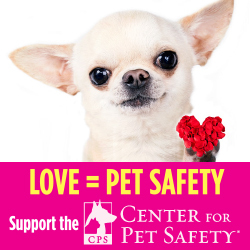 After working with the Animal Abuse unit in a major DA's office I learned of many well meaning rescuers that, according to the law, stole somebody's beloved pet. THANK YOU, THANK YOU, THANK YOU! @AmazonCares Glad you found finding lost dogs useful and thanks so much for stopping by! Excellent information! We are always on the look out for helpful tips and info to pass along to our dog boarding clients. Thanks for your faithful tips! What an interesting line: most are not strays, they are lost dogs. How heartbreaking! So glad she was reunited with all three of her dogs, though it took a lot of effort I am sure it was worth it. Thank you for sharing Mary! I can imagine most dog owners are in a state of panic when they first loose their dog. I had a close call with my dog, Mila. We live in NYC and I took her to the store with me. She slipped out of her collar and ran directly toward the automatic doors. Of coarse, they opened and outside she went onto the busy sidewalks of NYC!! I didn't know what else to do but chase after her; all that did was push her away more. As she was nearing the street I had no other option and yelled, "Get my dog!" A kind young woman knelt down and called Mila to her. She scooped her up and I made my way to retrieve her. It was a great ending to a very scary situation. However, if she would've ran away, I wouldn't have really known where to start to find her. You've really provided some great tips and important steps to take in this article. All pet owners should listen/read this in order to be prepared for if and when this horrific event may take place, because you never know! Great resource! We lost two of our dogs a few years ago and we put out flyers in many places including a popular 4-way stop. One of the flyers at the stop caught the eye of some guy who had seen the dogs on his property. Thankfully he called us because the pups had eaten some of his chickens and he was going to take matters into his own hands! @ruthcox Wow -- that's a different situation!,While that nose can lead him astray, it could work for you in the event he got loose. Thanks for stopping by! My biggest fear is to have a lost pet. This is a great post! @MichelleWolff11 Glad you liked it, Michelle and thanks for your visit! That is a great reminder! Many "stray" cats are just lost too. It is really important to have some compassion for these animals. Thank you for sharing. On of the things I fear is losing my dogs. I work on recall all the time, and they like to stay close by, so I feel pretty good, but I also know there are circumstances when that is not enough, and it truly does take a village to find a dog. This is a very interesting, important podcast for all dog lovers and dog parents to listen to- before they lose a dog. I did not have time to listen to the podcast now, but I'm definitely going to. Losing my dogs is one of my greatest fears, and I do know that being prepared before a tragedy like this ever happens will make a difference. Thanks for this post - it's important. Next post: Getting Naked for Money, on Kickstarter!